As we enter the hottest days of summer and run to the shelter of air conditioning and fan-cooled environments, it is easy to ponder related issues like thermal management in power electronics. The other side of the power coin is heat. Every aspect of a power system’s operation generates heat, and how it is mitigated and handled should be a major consideration in every design – not just those related to power systems. One way to reduce overall temperature footprint is to improve peak operation, as that allows you to use a smaller power converter for continuous use. Ericsson Power Modules’ third-generation BMR458 3E family of quarter-brick bus converters now offers burst-mode operation, enabling the module to handle 1,079 watts of peak power for a maximum of one second. This addresses the trend of high-performance microprocessors and ASICs to require brief bursts of high current demand that is typically well in excess of normal system operation (Figure 1). Better packaging is always a benefit, as getting the heat out of a package is as important as reducing the amount of heat you need to deal with. In that vein, STMicroelectronics added five space-saving surface-mount intelligent power modules to its SLLIMM-nano family, giving the choice of IGBT or MOSFET outputs for in-motor or other space-constrained drives up to 100W (Figure 2). The new modules deliver high conduction and switching efficiency, especially in hard-switching circuits, at frequencies up to 20 kHz. The integrated gate-driver circuitry is engineered to minimize electromagnetic emissions (EMI) by managing switching voltage and current slopes (dV/dt, di/dt). The thermally efficient package enhances reliability and allows heatsink-free design, while 2.7mm creepage and 2.0mm clearance ensure safety isolation within the compact dual-inline SMD footprint. On the hardware side, CUI expanded its existing portfolio of Peltier devices and DC fans with the addition of a new line of aluminum heat sinks, available in both extruded and stamped versions (Figure 3). 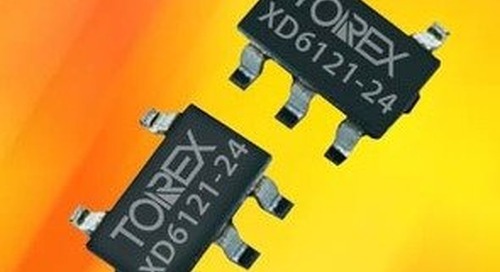 Compatible with TO 218, TO 220, TO 252, and TO 263 transistor packages, they are designed to improve the heat dissipation of low- and high-power board-level systems. Measured under four conditions for thermal resistance, the extruded and stamped heat sinks offer tin-plated or black anodized finishes with or without solder pins in vertical or horizontal orientations. Thermal resistances measured at 75 °C ΔT in natural convection environments are as low as 4.49 °C/W, while power dissipation ratings measure up to 16.7 W at 75 °C ΔT in natural convection. In this month’s wide-bandgap semiconductor news, Texas Instruments launched an innovative three-phase, gallium nitride (GaN)-based inverter reference design that can create a 200 V, 2 kW AC servo motor drive for next-generation industrial robotics with fast current-loop control, higher efficiency, more accurate speed, and torque control (Figure 4). The reference design uses TI’s latest LMG3410 600V, 12 A GaN power module with an integrated FET, gate driver and protection, and is able to switch up to 5x faster than silicon FETs while achieving efficiency levels greater than 98% at 100 kHz. With GaN, designers can optimize switch performance to reduce power loss in the motor, and downsize the heat sink to save board space. Operating the inverter at 100 kHz significantly helps improve torque ripple when used with low-inductance motors. On a final power note, Diodes Inc claims to have the world's first power switch completely compatible with USB Type-C power. The DPS1133 single-channel power switch also protects the VBUS lines to and from USB Type-C connectors, meets the fast role swap (FRS) timing criteria defined by the latest Release 3.0 V1.1 of the USB Power Delivery Specification, and supports all the allowed USB-C port operational modes.